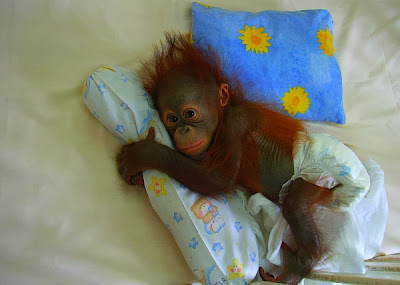 Two days ago, an orang utan rooted through his pile of clothes, trying to find a clean piece of underwear. He tossed and turned, flipping over shirts and shorts but there wasn't any piece visible. How could this be? What about his work? The orang utan was researching some chemicals at that time. How could he go for work and mix chemicals without wearing that protective piece of clothing? What if there was an explosion? That area is particularly important and it's always advisable to protect it with more cloth. O underwear, underwear, wherefore art thou? The character in the story. With each passing second, the ape became increasingly frustrated. But why did he feel the need to wear an underwear so desperately? The act of wearing undergarments is a social construct. Only apes wear them. Take a look, for example, at dolphins or dodos (when they existed). They frolic in the wilderness - stark raving naked - but feel absolutely no shame. Look at them, bouncing around, without a single stitch of cotton protecting their modesty. Yes, wearing undergarments reflects the blind and unquestioning obedience to a socially sanctioned construct. As a protest, the ape decided not to wear any for one day. Just as he was about to leave, the hairy creature turned around and found one piece, almost glittering in the sunshine. It was beige-coloured, soft and limp in his trembling hands. Yes, a clean underwear. One pristine piece. Isn't that a miracle? He started to giggle, then laugh and then quake with mirth, before putting the underwear on. At times, deliberately adhering to social constructs is no big deal.